Updated Sunday January 7, 2018 by Chris Johnson. 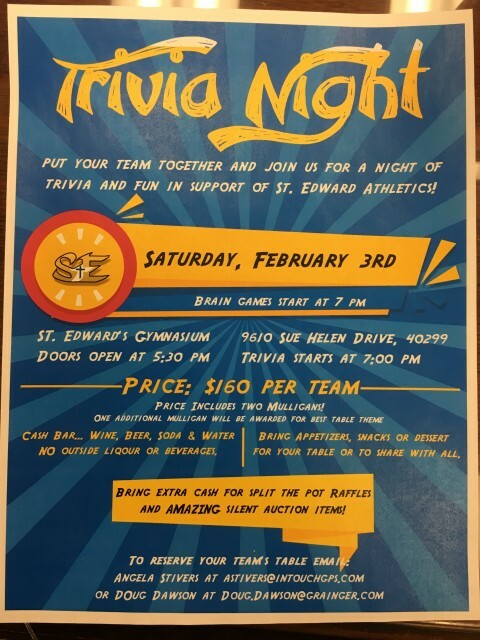 Please see the attached flyer announcing the details of the upcoming Trivia Night hosted by SEAM on February 3rd in the gym. We are limited to 40 tables so please make your reservation now; don’t delay as we are almost half way reserved now. Tables are limited to 8 people and will cost $160 per table. You will get 2 free mulligans for playing and an additional one for having a table “theme”. Bring your snacks and food while you purchase your beer, wine, sodas and water. No outside coolers or drinks are allowed. The proceeds of this event will benefit the student athletes of our parish community. The doors open at 5:30 and the questions will start at 7:00. If you want to reserve a table please reach out to Angela Stivers at astivers@intouchgps.com or myself at doug.dawson@grainger.com.